NEW!!! PaigeeDraw and PaigeeWorld has so far been focused on Traditional Art. We have received countless requests from PaigeeDraw members to provide some Digital Tutorials. Many members want to work on both Traditional and Digital formats. PaigeeWorld Digital will allow members to be assisted in both areas! The PaigeeDraw World Project is aimed to help the world learn how to draw Manga! 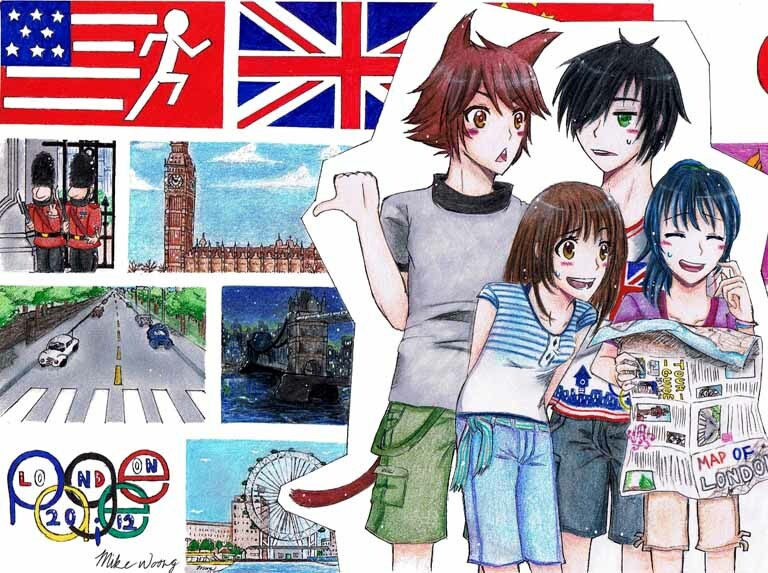 The purpose of PaigeeDraw World is to build an application to help individuals learn how to draw Manga, made by the best young artists from around the world! (ie The PaigeeDraw Communities). PaigeeDraw World Digital will allow tutorials based on Digital Applications! With PaigeeDraw World, the PaigeeDraw Communities, as well as Paige, will be creating step by step drawing tutorials, which for the successful applicants will be available on the PaigeeDraw Mobile Application PaigeeWorld, or available on the PaigeeDraw Internet Sites. NOTES: This is the first time we are having a DIGITAL competition. We will be learning as we go! Check the contest page frequently for contest updates. Rules and regulations may change during the contest. An opportunity for your art to be displayed on the #1 mobile application brand in the world for teaching aspiring Manga Artists how to draw! An opportunity to create a tutorial viewed by potentially hundreds of thousands of people around the world. To have your art seen by industry people around the world! Add to your art portfolio. Help others learn how to draw manga/anime. Show off your unique skills and techniques, while helping others with new drawing techniques and materials. An opportunity to help others learn how to draw! 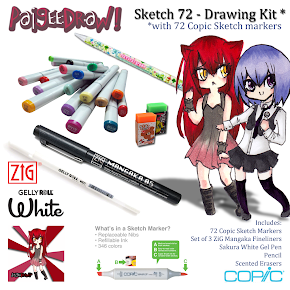 Character / Chibi submissions for PaigeeWorld Traditional must have a minimum of 9 unique steps per drawing (Maximum 25). All tutorials will be based off of existing PaigeeDraw Characters. Characters can be in regular or chibi format. All drawings must be done digitally. For traditional drawings, please see the traditional contest details. All drawings must be colored. With the exception of drawings that are "Colored" black and white. 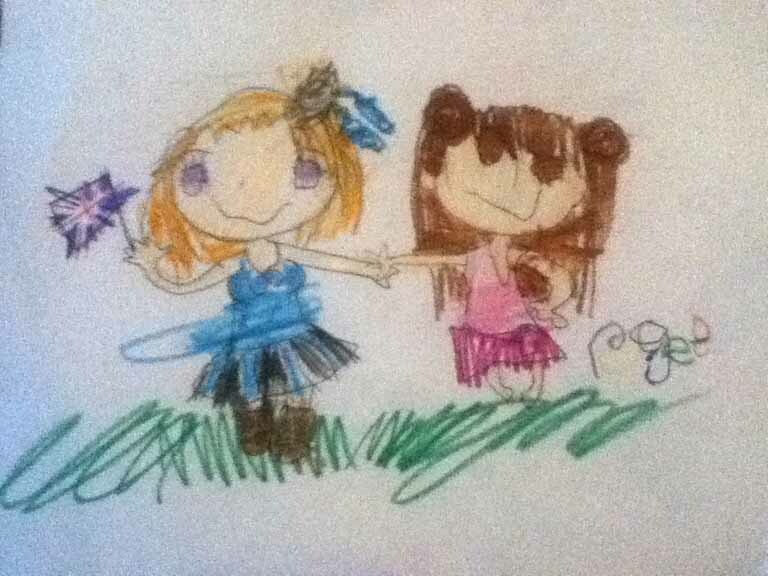 As PaigeeDraw is a site for all ages, age appropriate tutorials must be submitted. We reserve the right to refuse drawings that may not be suitable for all ages. All submitted tutorials will be the property of Paigee Draw Inc.. Credit will be given to the artist base on the information recieved with the tutorial submission. By submitting drawings, instructions, and any other content to PaigeeDraw, you grant PaigeeDraw an irrevocable, perpetual, sole, transferable, royalty-free, sub-licensable, worldwide license to use, copy, publicly display, reformat, translate, excerpt (in whole or in part) and distribute all content you have submitted for any purpose, commercial, advertising, or otherwise (the “IP License”). How can you add some flair to your drawing tutorial? Where do you come from? PaigeeDraw has been downloaded from over 80 countries around the world. We encourage our members to add something extra from your part of the world. If you are from Japan, Korea, Germany, England, USA, etc, add something to reflect this in your drawing. Is there something about your state or territory that you would like to add - no problem, use your imagination. Dont be limited either to where you are from - if you want to add a theme to your drawing from a country that you like - definately do so! Note: Contest prizes will be given out during the duration of the contest. Note: PaigeeDraw World is schedule for release in October 2012. Paige Rohrick will decide the tutorials that will Qualify for PaigeeDraw World. No purchase is required. Start Drawing! Note: For large tutorials, please send multiple emails with about 3 drawings per email. Document with Tools and Instructions for each step. Note: If required, you can send multiple emails. Please see Advanced Instructions below. There is NO LIMIT on prizes to be given away! You can also WIN multiple prizes if you have multiple winning tutorials! PaigeeWorld will give artists from around the world a chance to be featured on the PaigeeWorld Application available for Apple devices, and in the future Android. Available in almost every country around the world! Excellent for your art portfolio! 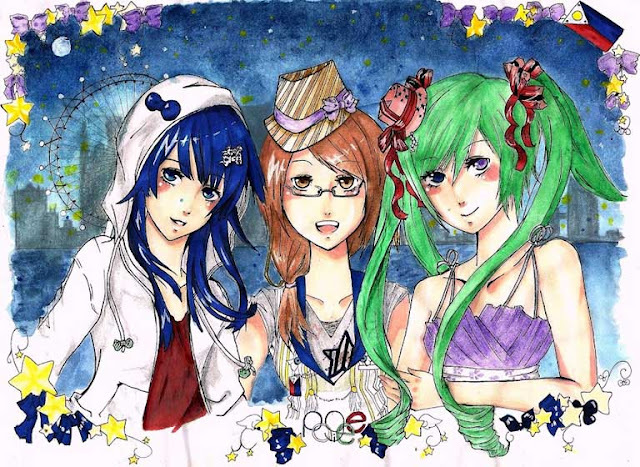 PaigeeWorld will give artists from around the world a chance to be featured on the PaigeeDraw Tutorials Web Pages. PaigeeWorld will give artists from around the world a chance to be featured on the PaigeeDraw Facebook Communities - with up to 50,000,000 facebook impressions per month and growing! ie. Alot of people will see your art! Paige will select at least 1 character or chibi tutorials submitted to Win the following Prize: These prizes may be given away at any time and will be announced on the PaigeeDraw Blog, or the PaigeeDraw Facebook page! You will also receive an email to the email address that you sent the tutorial from. 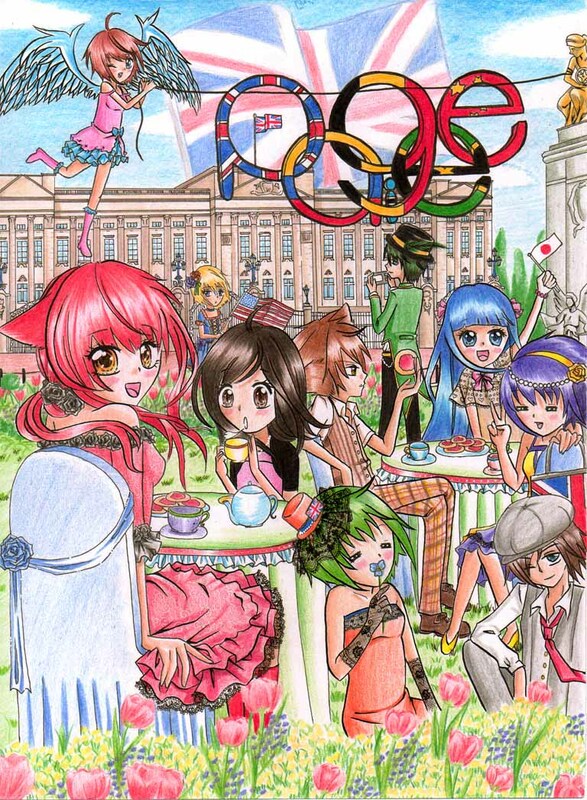 Your Drawing may be displayed as "Contest Winner" on a future release of PaigeeWorld Application. Your Tutorial may be displayed on PaigeeWorld Application. 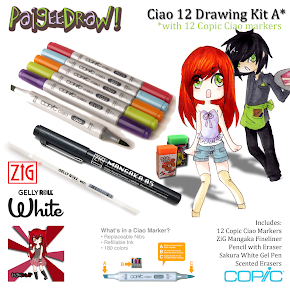 **All submitted drawings may be featured on any of the PaigeeDraw Sites, including the PaigeeDraw, ChibiDraw, PaigeeWorld and PaigeeDraw Boys facebook page - all entry details will be included with the drawing. All submitted drawings may be featured on the PaigeeDraw Web Site, PaigeeDraw Blog, PaigeeDraw Online Store, or the any of the PaigeeDraw Applications including PaigeeDraw, ChibiDraw, PaigeeDraw Christmas, PaigeeWorld and PaigeeDraw Boys. ****Only one Coupon Code is valid per transaction. If you have won multiple prizes for multiple tutorials, you can send us an email to combine your Coupon Codes. 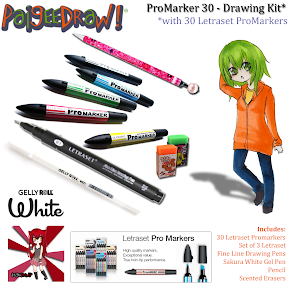 Since all drawing tutorials will be made for either the PaigeeWorld Application, or a PaigeeDraw Web Site, special consideration has to be made when submitting tutorials. All tutorials should be created in 3:4 portrait dimensions (roughly a 8.5x11 piece of paper). Image resolution should be at least 768x1024 preferred, but can also be submitted in a larger resolution format. All Steps must be submitted individually. You must take the time to ensure that the orientation of each drawing, is in line with the orientation and dimensions of all other drawings submitted. You may create a Video Tutorial as well for your tutorial(Please do this separately from your original tutorial - ie, make a video tutorial of a drawing similar to your entry). If you do so, upload directly to Youtube or any Video service on the internet. 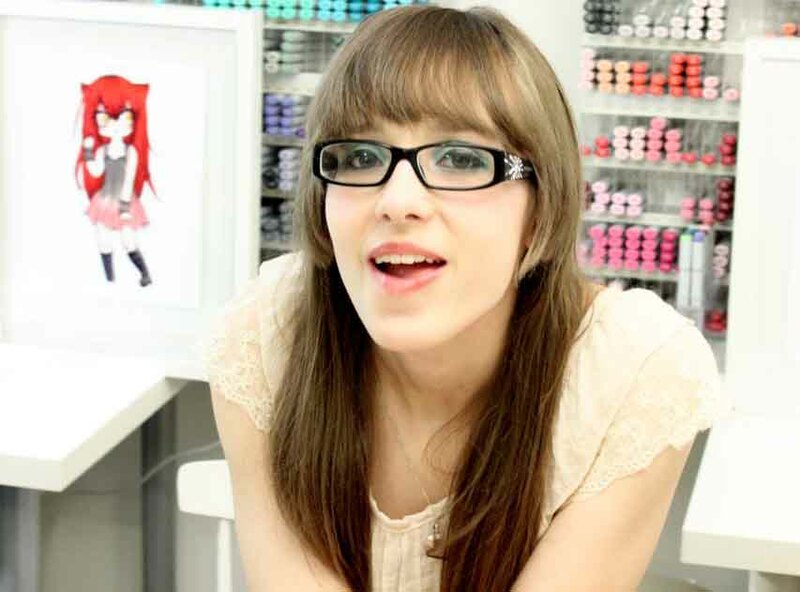 Ensure you mention PaigeeWorld, as well as http://www.paigeedraw.com on the Video description. Send us the link to the Video Tutorial with your entry and we will then do our best to link your tutorial from the application or web page, to your video tutorial. All character and/or chibi tutorials must include a minimum of 9 individual drawing steps, with a maximum of 25 steps per drawing. All face, hand, eye, fashion, clothing, accessory, etc., tutorials must have a minimum of 5 individual drawing steps, with a maximum of 15. Please include tools and instructions documentation for every step in your tutorial. Please include your personal signature on your tutorial. The purpose of PaigeeWorld, is to give our community credit for the best drawing tutorials for learning how to draw manga. This is optional but encouraged. Please reference any of the existing PaigeeDraw Applications to see the formatting that we will use for the PaigeeDraw World application. In the above examples, there is sufficient room for buttons on the right side, border images in the corners, as well as an image title on the top left. The reason why images need to be transparent, is because may additional elements will be layered with the individual tutorial drawing images. If you have any questions, please email to me at fanpage@paigeedraw.com. I will try to update the PaigeeWorld Page with a Frequently Asked Questions (FAQ), below. What application do I use to create the Digital Art? Any Application that you would like. Please try to give instructions so that anyone can recreate, regardless of application used. Can I submit more than one tutorial? Yes. I would recommend only sending in one at a time. I will provide feedback to help you if requested. Yes. But you cannot win more than one primary prize. 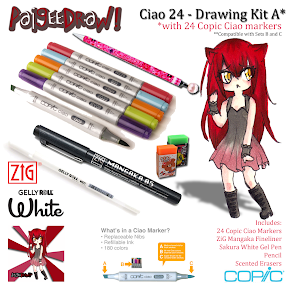 If you have multiple tutorials selected for the application, you will win 6 Copic Ciao Markers per character or Chibi tutorial, and 4 Copic Ciao Markers per other tutorial. What format to submit the drawing in? The preferred format is .PNG. You can also send them as JPG or PDF. Where do you post the tutorial? The tutorial could be posted to: Any PaigeeDraw Web Page, Any PaigeeDraw Community Page. In the future it MAY be posted to a PaigeeDraw App. Can my drawing have a background? Yes. Our new Application PaigeeWorld does support backgrounds. Can I use Google Translate to translate my instructions. Yes, but if your tutorial is selected, the instructions will probably be edited by PaigeeDraw. Where do I put my signature? You do not need to add your signature. If you do, you can add it anywhere on your drawing. Please keep it small. How much content do you need for the app? 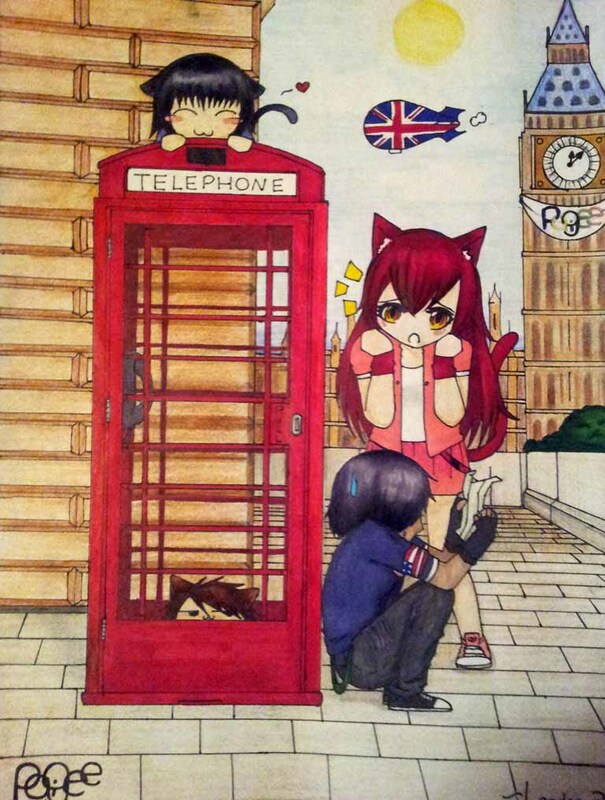 We already have 60 Winners with the first round of PaigeeWorld! There is no limit to how many tutorials can be added to the app! The PaigeeDraw Community has been asking for ways that they can help and contribute. There are soo many different styles and techniques for people that want to learn how to draw Manga. Chibi styles, character styles, eyes, hands, clothing, etc.. There are also many different types of materials that can be used to make a fantastic drawing. PaigeeDraw is about traditional drawing, and traditional materials. However, members use pencils, crayons, paints, markers, etc, to create their amazing drawings. So far, PaigeeDraw has been focused on drawing with Markers, however we would like to expand to not only help people with Marker drawings, but whatever traditional media they would like to use. PaigeeDraw World will allow tutorials based on any traditional drawing material! With PaigeeDraw World, the PaigeeDraw Communities, as well as Paige, will be creating step by step drawing tutorials, which for the successful applicants will be available on the PaigeeDraw Mobile Application PaigeeWorld, or available on the PaigeeDraw Internet Sites. All drawings must be done traditionally! We encourage the use of PhotoShop or similar to clean up / enhance images. No purchase is required. Bring out your scanner, and start drawing/scanning! 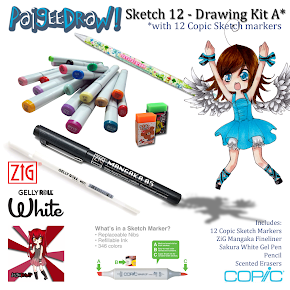 Paige will select at least 3 character or chibi tutorials submitted to Win the following Prize: These prizes may be given away at any time and will be announced on the PaigeeDraw Blog, or the PaigeeDraw Facebook page! You will also receive an email to the email address that you sent the tutorial from. If possible, your tutorial submissions should be transparent(see examples included below). If you do not know how to use Photoshop, PhotoShop Elements, or some other graphics program on the computer to edit/enhance your drawing, Paigee Draw Inc. will have to perform the editing for you. Since this takes large amounts of time, preference will be given to tutorials that are better prepared. All images must be scanned. Photographed drawings will not work for our Mobile Application or web formats. All Steps must be scanned individually. You must take the time to ensure that the orientation of each drawing, is in line with the orientation and dimensions of all other drawings submitted. Can I photograph my pictures and send them to you? No. All images must be scanned. Photographs do not have adaquate image quality for use by mobile apps. Yes. But you cannot win more than one primary prize. 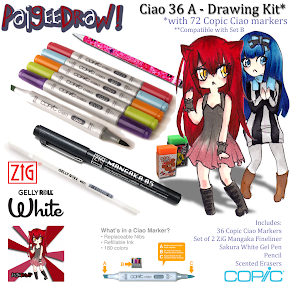 If you have multiple tutorials selected for the application, you will win 6 Copic Ciao Markers per character or Chibi tutorial, and 3 Copic Ciao Markers per other tutorial. Yes. Our new Application format does support backgrounds. Story: "We're lost aren't we?" Paige says to Mike. "No,of course not!" Mike replies, "We're just... taking a detour!" Aaaaand.. they're lost. Our heroes' journey started with Paige suggesting to go to London a few days earlier to tour the place and then watch the Olympics that are being held there. Upon exiting the airport (plus a few twists and turns here and there), Paige, Yuma, Kuya, and Mike got lost. No really. They're lost. But, as it turns out, our heroes aren't at the end of their rope. While wandering around, they happened to arrive at their chosen (-ish) destinations. Even if it was mostly Yuma who seemed to be able to lead the group there. The Paige-Yuma-Kuya-Mike group started their London trip by visiting the Buckingham Palace where they took a few pics of the Buckingham Guards at the entrance. Next, they made their way to Big Ben, the famous clock tower of London. Both Paige and Yuma were really excited to see it and sighed in wonder. After, they asked around and eventually made it to the famous Abbey Road, where the famous Beetles band were famous for struttin' across Abbey Road. They took a picture of it as a souvenir. Continuing on with their tour of London, it was surprisingly Kuya who led them to the infamous London Tower Bridge. "During the night, the lights on the bridge cast a magnificent blue glow that's supposed to be pretty neat," Kuya says. "I didn't know you were a fan of the London Tower Bridge, Kuya!" Paige exclaims excitedly. On the way to see the London Eye, the group chatted about the upcoming Olympics and which countries they supported. "I'm supporting America, Japan, China, and London!" Mike cheered happily. "I think I'm gonna support Japan and Canada," Paige beams. Yuma stops and thinks for a second and exclaims "I guess I'll support Japan then! I am part Japanese afterall!" "Goes the same for me too," says Kuya, "I'll be supporting America, London and Japan." As they chattered happily, they eventually wound up at the London Eye. Paige convinced the group to go up into the cars of the Eye, although there was some persuasion involved with Yuma considering he was afraid of heights! Paige, Kuya, Mike, and Yuma all rode up the ferris wheel and at the top of the London Eye, they could see just how magnificent London had made itself for the Olympics. And as the group was slowly revolving around the ferris wheel, they knew that they and countless other people in the world were looking forward to the grand and auspicious 2012 London Olympics! Story: While taking in the sights before the PaigeeDram Olympic games, the nekos and I lost track of time, along with out sense of direction; we got lost! Fortunately we got lost near Big Ben- which is much easier to find on a map than some random street in London. But time is running out- and the minutes until the games start to decrease. Although Yuna and Yuma don't seem to care much and decide to play around. But Nyan- she doesn't want to miss anything! Will we make it in time! ?